Back in the late 1950’s up until withdrawal in January 1961 GWR 15XX Class 0‑6‑0PT No. 1501 was a longstanding resident of 81C Southall. Saved from oblivion by the preservation movement No. 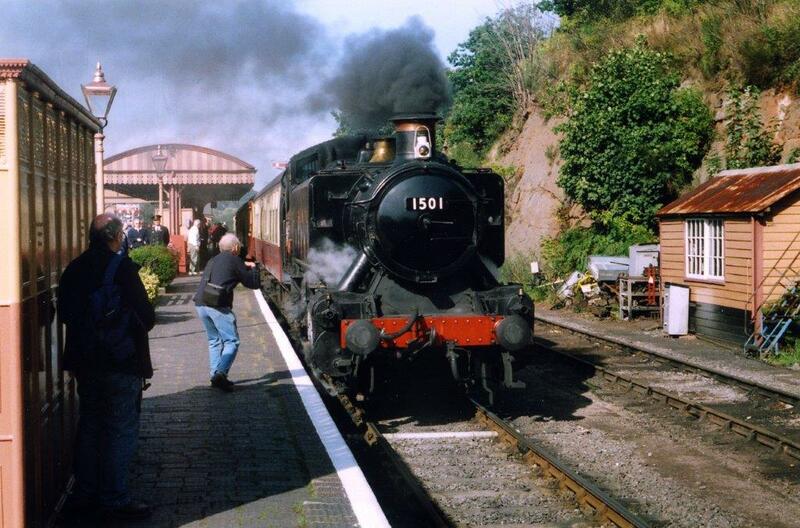 1501 is captured on film in pristine condition in Platform 3 at Bewdley on the Severn Valley Railway with a local passenger for Kidderminster on 25th September 2005. ‘A’ Shop at Swindon Works on 28th April 1963. The overhaul for GWR 94XX Class 0‑6‑0PT No. 8459 (81A Old Oak Common) is all but complete although the centre driving wheels are still to be added. Keeping No. 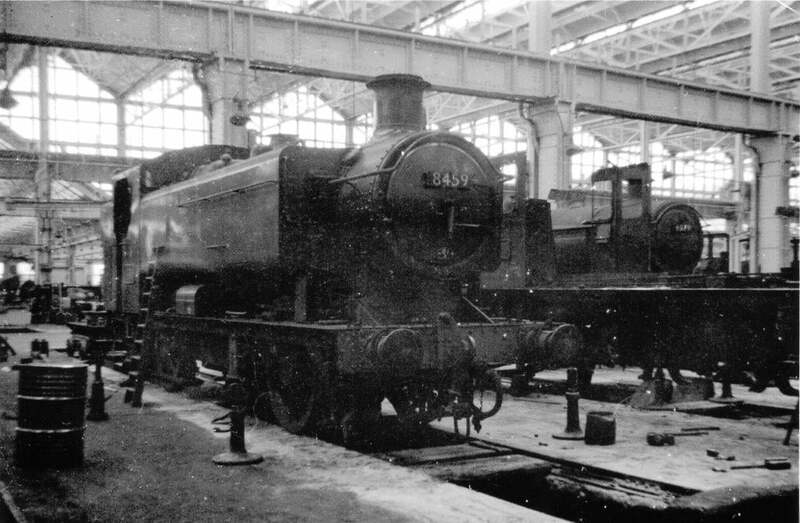 8459 company are GWR Hall Class 4‑6‑0 No. 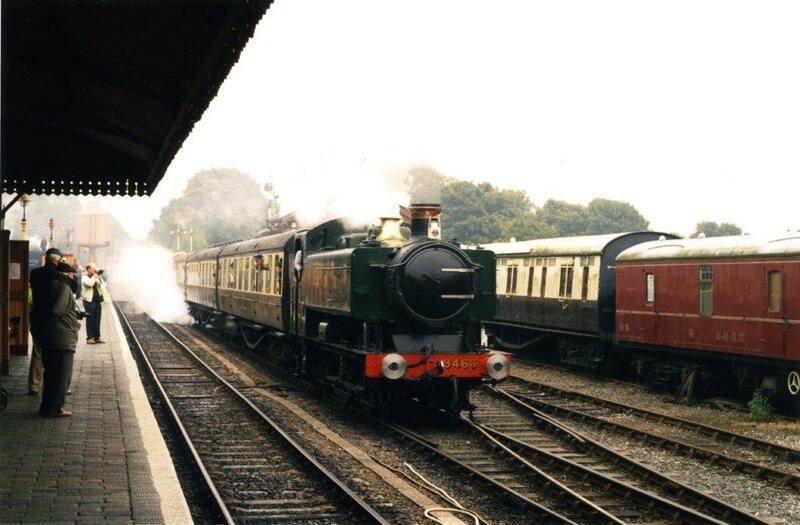 6938 Corndean Hall (81D Reading) and GWR Modified Hall Class 4‑6‑0 No. 6979 Helperly Hall (84C Banbury). Once of the likes of Worcester, St.Philip’s Marsh, Tondu and Cardiff (Radyr) Motive Power Depots GWR 94XX Class 0‑6‑0PT No. 9466 rusted away in Barry Docks from November 1964 until September 1975 moving to Quainton Road in Buckinghamshire where restoration awaited. No. 9466, in GWR livery, coasts into platform 1 at Bewdley on the Severn Valley railway with a local passenger from Kidderminster on 22nd September 2001. There are no known additional amendments and queries appertaining to the disposals of the GWR 15XX, 34XX, 84XX and 94XX series of 0‑6‑0 Pannier Tanks, but any information to the contrary will be welcomed as would any confirmations or otherwise for verifications required. Author’s Note: Discrepancies between the monthly withdrawal dates as published in the 1983 edition of WHTS Volume Thirty‑One and the updated version online are negligible.